It is with complete horror and sadness that I am writing this report about the Drumragh River. As I am sure many of you are now aware of the huge (100,000 gallons of slurry) pollution incident on the river outside Dromore Co Tyrone on Wednesday 23rd May. This resulted in a massive fish kill of catastrophic proportions and the plume of the slurry carried all the way to the Drumragh River killing almost everything in its path. 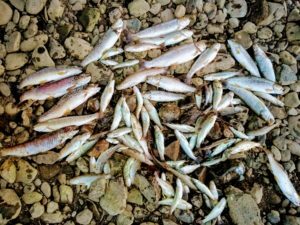 Some of the best trout fishing on the Drumragh and Owenreagh rivers suffered complete losses in different areas.The efforts put in by Members , committee and also the Loughs Agency staff have to be commended. Many thanks to all of you! Seamus Cullinan worked around the clock from wednesday through to friday night when I again met him on the Drumragh at ten o’ clock at night. The Loughs Agency tried the pumps further upstream in a few places but the slurry was too thick for the pumps to have any effect. The aeration pumps placed behind Slevins Chemist could have possibly helped in breaking up the slurry matter before it got into the main Strule and continued doing damage. The aeration pumps and the Camowen coming in with fresh water helped break up and dilute the slurry further so that it didnt have any adverse effect on the main Strule River. We were gathering trout and salmon parr from the area through the golf course in Omagh and whilst there were many trout there were also huge numbers of salmon parr killed. This will affect our salmon runs for the next few years and I think that may be the understatement of the year. The smell still coming of the river on saturday evening was still as bad and soon the bigger trout will start to bloat and come to the surface. 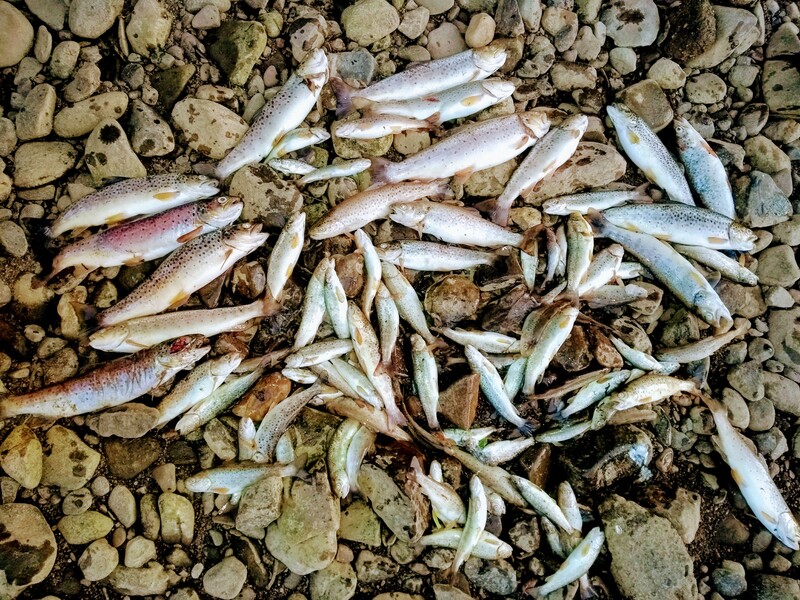 I have seen trout over 2lb in weight as part of the fish kill. Allegedly this was a completely new holding point built for the slurry and yet the wall collapsed. Questions are being asked but before we give any immediate knee-jerk reactions we will wait on the report to come in before we decide on a course of action. Suffice to say we have contacted Fish Legal about the matter and will enter into further correspondence with them about taking a case in the near future. 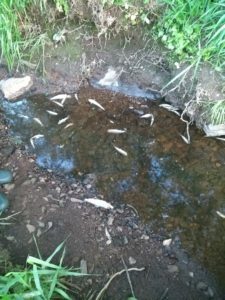 On a slightly brighter note I have walked areas of the Drumragh today Sunday 27th May and have found small pockets of trout that have survived and are feeding away in quite a number of places from Ballynahatty bridge down stream.It is a slight positive but still doesn’t take away from what happened on wednesday.